This blog does not try to compare all available Web Services Development Frameworks but focuses only on three popular approaches regarding three Open Source frameworks: Apache CXF, Apache AXIS & Spring WS. Though Spring Core Framework is an established technology, Spring Web Services is still evolving in comparison with Apache CXF and CXF has wider support of standards and proven framework from performance perspective. 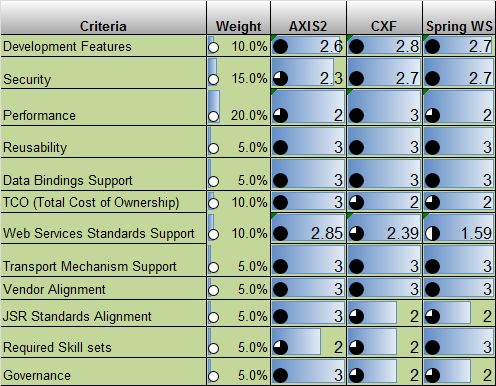 Hence, Apache CXF is the recommended framework and clearly the most preferred in my opinion.